Edgemoor Investment Gives Its Verdict On Visa, Will It Burn These Hedge Funds? Most investors tend to think that hedge funds and other asset managers are worthless, as they cannot beat even simple index fund portfolios. In fact, most people expect hedge funds to compete with and outperform the bull market that we have witnessed over the past few years. However, hedge funds are generally partially hedged and aim at delivering attractive risk-adjusted returns rather than following the ups and downs of equity markets hoping that they will outperform the broader market. Our research shows that hedge funds do have great stock picking skills, so let’s take a glance at the smart money sentiment towards Visa Inc (NYSE:V). Visa Inc was in 112 hedge funds’ portfolios at the end of the third quarter of 2018. V has seen an increase in support from the world’s most elite money managers in recent months. There were 109 hedge funds in our database with V positions at the end of the previous quarter. Overall, Visa is the 8th most popular stock among the 694 hedge funds that disclosed their Q3 holdings recently (check out the list of 30 most popular stocks among hedge funds now). In the financial world, there are a large number of tools investors have at their disposal to grade stocks. A pair of the most under-the-radar tools are hedge fund and insider trading indicators. We have shown that, historically, those who follow the top picks of the best fund managers can outperform the broader indices by a solid amount. Insider Monkey’s flagship best performing hedge funds strategy returned 17.4% year to date (through early November) and outperformed the market by more than 14 percentage points this year. This strategy also outperformed the market by 3 percentage points in the fourth quarter despite the market volatility (see the details here). That’s why we believe hedge fund sentiment is a useful indicator that investors should pay attention to. “Visa is the largest provider of electronic payment processing services, with a 58% global market share compared to the 26% market share of its closest competitor, MasterCard. Visa is accepted by 44 million merchants worldwide and has over 3.1 billion cards in circulation, twice that of MasterCard. The Visa network processed $8.2 trillion worth of transactions in the twelve months ended September 30, 2017, more than MasterCard, American Express, and Discover combined. Over 16,800 financial institutions are part of Visa’s worldwide network, the biggest in the industry. Visa’s growth has been propelled by increased consumer spending as the global economy has recovered and by the increasing use of digital payments over cash transactions. Still, more than 85% of the world’s retail transactions are conducted with cash or checks, leaving significant upside for all electronic processors to grow. For consumers, the transition from cash to plastic brings numerous benefits including convenience, safety, and increasingly attractive rewards programs. In June 2016, Visa completed its acquisition of affiliate Visa Europe for EUR18.3 billion. The combination provides scale advantages, cost savings, and revenue opportunities to Visa, as the company will now capture 100% of Visa Europe’s growing cross-border volumes, fees, and profits. The acquisition is expected to be accretive to Visa’s earnings this upcoming year. Visa is also eyeing expansion in China, where the state bank clearing system was recently opened to Visa and MasterCard to launch card-processing networks as early as 2018. Our regular readers will be interested to know that Alfred F. Kelly, Jr., also known as Al, the Chief Executive Officer of Visa Inc. since December 1, 2016, was responsible for the last major insider purchase in the company’s common stock. He purchased 1,575 shares at $222.70 in 2014, which doesn’t seem a prudent investment in hindsight, considering the share price of the company has tumbled to $136.81 since then. Heading into the fourth quarter of 2018, a total of 112 of the hedge funds tracked by Insider Monkey were long this stock, a change of 3% from the second quarter of 2018. 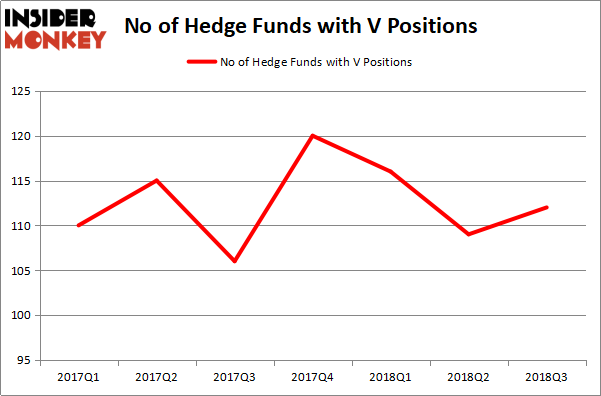 The graph below displays the number of hedge funds with a bullish position in V over the last 7 quarters. With hedge funds’ capital changing hands, there exist a few noteworthy hedge fund managers who were increasing their stakes substantially (or already accumulated large positions). 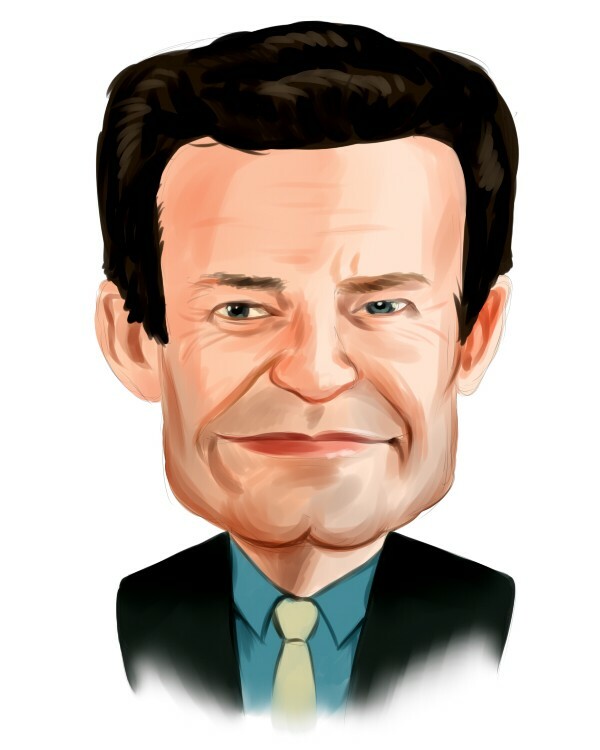 When looking at the institutional investors followed by Insider Monkey, Ken Fisher’s Fisher Asset Management has the number one position in Visa Inc (NYSE:V), worth close to $2.7148 billion, corresponding to 3.3% of its total 13F portfolio. The second most bullish fund manager is Warren Buffett, holding a $1.5853 billion position; the fund has 0.7% of its 13F portfolio invested in the stock. Remaining professional money managers with similar optimism encompass Peter Rathjens, Bruce Clarke and John Campbell’s Arrowstreet Capital, Ken Griffin’s Citadel Investment Group and Charles Akre’s Akre Capital Management. Consequently, specific money managers were breaking ground themselves. Coatue Management, managed by Philippe Laffont, initiated the most outsized position in Visa Inc (NYSE:V). Coatue Management had $33.5 million invested in the company at the end of the quarter. Louis Navellier’s Navellier & Associates also initiated a $5.1 million position during the quarter. The other funds with new positions in the stock are Andrew Feldstein and Stephen Siderow’s Blue Mountain Capital, Karim Abbadi and Edward McBride’s Centiva Capital, and Tom Sandell’s Sandell Asset Management. Let’s now take a look at hedge fund activity in other stocks – not necessarily in the same industry as Visa Inc (NYSE:V) but similarly valued. These stocks are Royal Dutch Shell plc (ADR) (NYSE:RDS), Bank of America Corporation (NYSE:BAC), Walmart Inc. (NYSE:WMT), and Pfizer Inc. (NYSE:PFE). All of these stocks’ market caps are closest to V’s market cap. As you can see these stocks had an average of 64 hedge funds with bullish positions and the average amount invested in these stocks was $10888 million. That figure was $14435 million in V’s case. Bank of America Corp (NYSE:BAC) is the most popular stock in this table. On the other hand Royal Dutch Shell plc (ADR) (NYSE:RDS) is the least popular one with only 36 bullish hedge fund positions. Compared to these stocks Visa Inc (NYSE:V) is more popular among hedge funds. Considering that hedge funds are fond of this stock in relation to its market cap peers, it may be a good idea to analyze it in detail and potentially include it in your portfolio. Hedge Funds Are Buying CBL & Associates Properties, Inc. (CBL) Is Customers Bancorp (CUBI) A Good Stock To Buy? Incandescent Capital Gives Its View on Heritage Insurance Do Hedge Funds Love Exelixis, Inc. (EXEL)? Do Hedge Funds Love Manpowergroup Inc (MAN)? Do Hedge Funds Love Fastenal Company (FAST)?